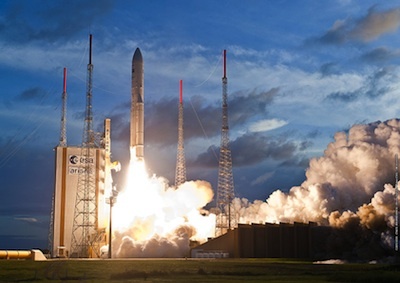 Two payloads launched aboard an Ariane 5 rocket last week are healthy and set to begin missions beaming broadband Internet services to North America and collecting real-time weather imagery for Europe's meteorological satellite agency. The EchoStar 17 and MSG 3 satellites are using on-board engines to raise their orbits to geostationary altitude more than 22,000 miles above the equator. The spacecraft launched aboard an Ariane 5 rocket Thursday in a spectacular sunset blastoff from French Guiana. The launcher's upper stage released EchoStar 17 and MSG 3 about a half-hour after liftoff, marking te 49th straight success for the European launch vehicle. EchoStar 17, built by Space Systems/Loral, will expand high-speed broadband Internet capacity over North America for the HughesNet service operated by Hughes Network Systems, a subsidiary of EchoStar Corp. The satellite deployed its two solar array wings after separating from the Ariane 5 rocket, according to a statement released by Space Systems/Loral. 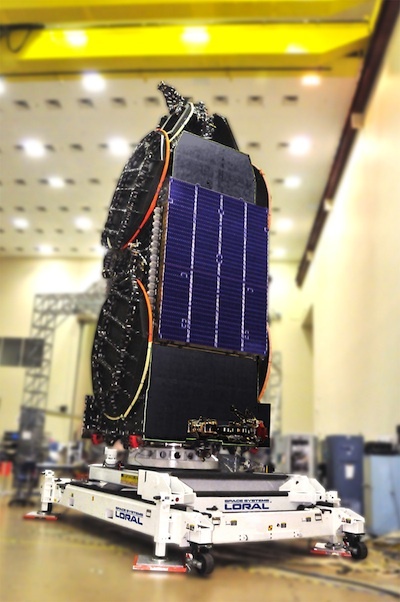 EchoStar 17 did not succumb to a glitch which caused permanent damage on the similar Intelsat 19 satellite, but engineers investigating the problem are focusing on an anamoly observed during its launch on a Sea Launch Zenit 3SL booster. "It has been our privilege to work with Hughes on this advanced satellite for broadband in the U.S.," said John Celli, president of Space Systems/Loral. "The excellent spirit of teamwork between our companies has resulted in one of the world's highest capacity satellites to ever launch." Previously named Jupiter 1, the EchoStar 17 satellite has capacity for more than 100 gigabits per second to enhance HughesNet service over the United States and Canada. EchoStar 17 will provide high-speed Internet access to nearly 2 million additional customers. EchoStar 17 launched with a mass of about 13,448 pounds, and it features 60 Ka-band communications beams. The craft will be stationed in geosynchronous orbit at 107 degrees west longitude. "We're going to put this into service as the most advanced broadband satellite system in the world," said Adrian Morris, executive vice president of engineering at Hughes Network Systems. Manufactured by Thales Alenia Space for Eumetsat, Europe's weather satellite agency, the MSG 3 satellite is the third of four current-generation Meteosat observatories planned to launch through 2015. MSG 3 will collect highly-detailed imagery of Europe, the North Atlantic, and Africa every 15 minutes for use by weather forecasters. "The launch of MSG 3 is a great success not only for space in Europe, but also for all those people throughout the world who use data and imagery from meteorological satellites," said Philippe Goudy, head of the Earth observation products department at the European Space Agency, which manages development and procurement of MSG satellites for Eumetsat. The 4,486-pound satellite will operate for at least 7 years, and it will be renamed Meteosat 10 when it enters service. 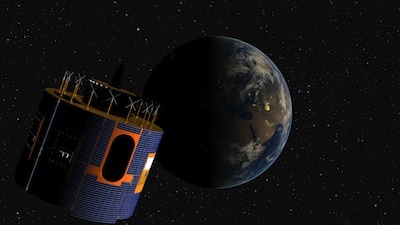 It will replace Meteosat 8, which launched in 2002 and has surpassed its design life, according to Sergio Rota, head of geostationary satellite programs at Eumetsat. Rota said Meteosat 10 will enter service at the beginning of 2013, assuming responsibility for full-disk imaging of Earth in a zone stretching from the North Pole to the South Pole and from Chile to India. Meteosat 9 - launched in 2005 - will take over rapid-scan services, collecting data every 5 minutes in a specific region over Europe. "We are confident that, at the end of the commissioning phase, the continuation of our service from geostationary orbit to our member states will be secured until at least 2020," said Ernst Koenemann, director of program development at Eumetsat.